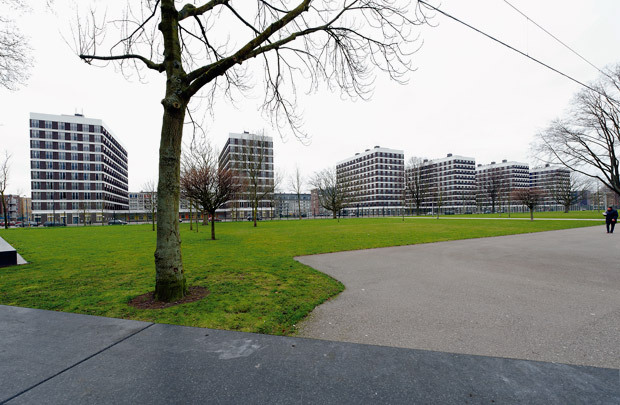 The 'south-west quadrant' of Osdorp with its bleak blocks of flats from the 1960s has been restructured to an urban layout by Endry van Velzen of De Nijl architects. The built portion has been compacted with high-rise along the edges and the adjoining green strip widened. Six towers containing 238 dwellings stand in pairs atop an underground parking facility. On the ground floor are the entrances, reached from communal gardens with commercial units on three sides. The towers are borne aloft by precast concrete structural facades with integrated brickwork. If the main forms lock into the existing architecture, the application of materials is consistent with present-day requirements. The uniformity of the cladding units precludes identifying individual dwellings.